Mention “haggis” to a random group of people and the likelihood is high most will screw up their faces and squeal “Eww.” The likelihood is equally high that none of those people have ever actually tasted the stuff. They may not even know what, exactly, it is. 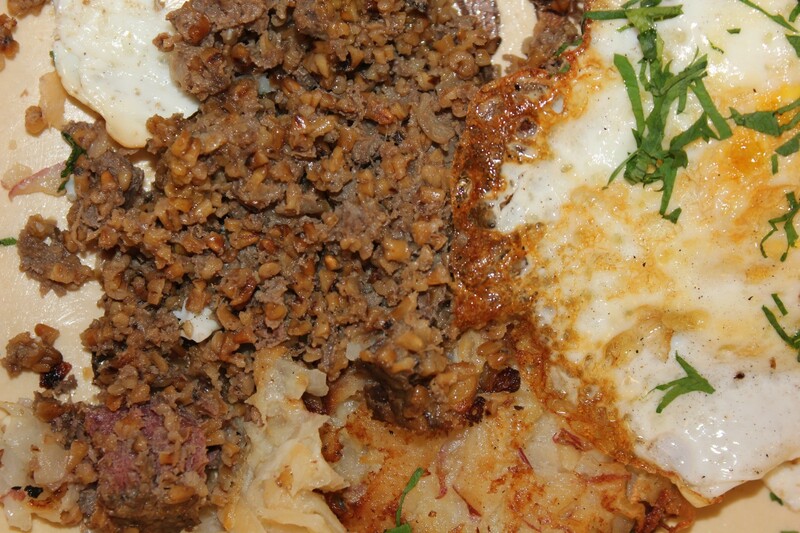 Haggis is a type of sausage, popular in several parts of the U.K., but mostly Scotland. Haggis traditionally contains sheep’s pluck (lungs, liver and heart), onions, oatmeal, spices and mutton fat, boiled in a sheep’s stomach. That’s the real thing, which you may not have in the States because the sale of lung was banned in this country in 1971. Brad Knaub is the meat man at Oak Park’s Carnivore, which he runs with fish guy Erik Williams. He’s making haggis for Burns Day, and he gave us a preview. For this preview tasting, Knaub wasn’t able to source sheep’s stomach, so he’s used a standard sausage casing. He sliced off circles of the finished sausage, pan-fried them in lard and added two over-easy eggs. This haggis was very good, not just tolerable but very good. The organ-y undertones were not overwhelming, and the barley had deep richness and an outer crispiness that made this a hugely flavorful, texturally intriguing mouthful. “The combination of liver and oats smells like straight-up peanut butter,” says Knaub, and there was a definite nutty note to the delicious mess. Knaub served the haggis with three small pancakes of shredded turnip and potatoes—neeps and tatties—and the turnips in particular hold their own against the haggis. And Carnivore is an excellent place to purchase more than just unusual sausages. Williams sources hard-to-find seafood like puffer fish, sand dabs and wolf fish, as well as fresh whole sardines and octopi. For Burns Day, Knaub plans to make several whole haggis sausages cooked in a full sheep’s stomach. For that, though, you need to give Knaub at least three days’ notice—and you must commit to the whole bellyful, easily enough for your entire clan. Carnivore is the best thing to happen to food in Oak Park in a long time; click to see a video I just produced with the Village of Oak Park about Knaub’s preparation of traditional Bavarian weisswurst. If you’d like the full Burns Day presentation—with haggis, neeps, tatties, homemade shortbread and flights of Scotch—The Peckish Pig in Evanston is doing it up right, and yes, there will be dancers and bagpipes.